RPM Rural Products supply livestock and rural equipment throughout Australia and overseas. One product on offer is the loading ramp. Loading ramps are available to suit every requirement and provide the perfect addition to a yard once installed. 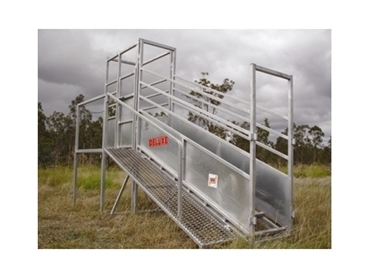 The standard loading ramp is 3 metres fixed in height and is designed for cattle use. These ramps are designed especially for smaller yard systems and are also beneficial for basic loading or unloading from truck heights. The all-rounder ramp is versatile and can be used in either a small or large yard system. With a 3 metre long adjustable ramp, the operator has the ability to load from a trailer to truck height. The deluxe ramp is a design for a larger yard system and is the largest ramp on offer from RPM. Standing at a fixed height of 4.3 metres the ramp also features a hardwood floor, a 1.3 metre flat load section and a walkway which is complete with a handrail and side access/block off gate.